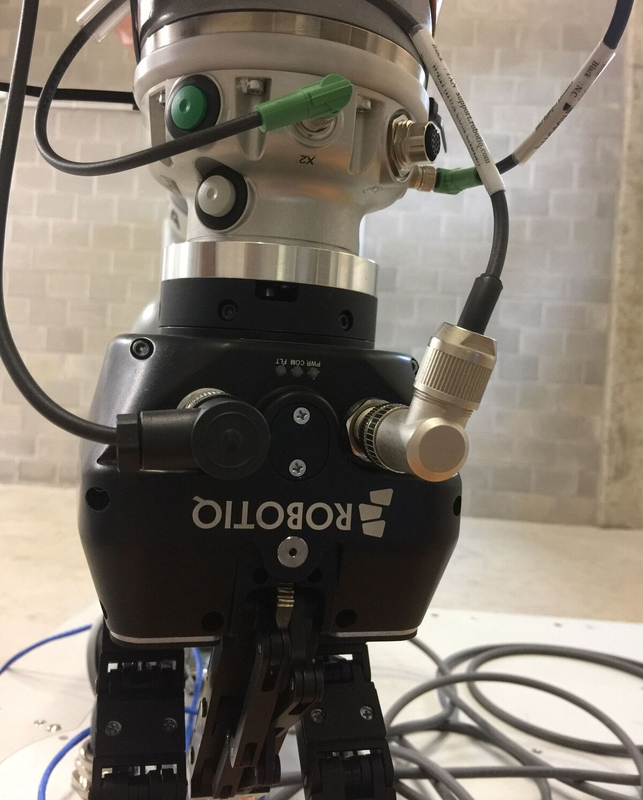 I recently got a Robotiq 3-F gripper for our KUKA LBR iiwa with touch-electric media flange. The robotiq gripper contained two cables for the PWR and the COM. I was expecting that hooking these two cables and thereby turning the LBR iiwa (on top of KMR) would turn on the gripper. However, as can be seen via the photo attached. This has not been the case. Can you suggest a remedy. Ideally one that can allow me to check if the gripper is in working condition. Secondly, as a remedy I thought that by uploading a sunrise project with configured IO's it might turn on. This also did not solve the problem. Can you also point me to some documentation that allows setting the IO configurations from scratch of a robotiq 3F gripper on work visual. As I am using one that were generated for another similar setup. (I copied IOConfiguration.wvs, IOTemplates folder and generated files/IODescriptions). It turns out to be an issue with the cables provided by robotiq. The power cable connects PWR on gripper to X75 on robot. This doesn't work. I got a cable that connects PWR to X3 and it turns on immediately and resumes normal operation. I wonder why robotiq provides a cable with connection to X75? Is it possible to power the gripper that way? @sat_714, X3 also have digital I/O. By using the dedicated 3 pole X75 Power supply connector, digital I/O will be still available on X3 and the gripper will be supply by X75. You must bring the 24 volts to the X76 connector as shown in the iiwa media flange documentation.